Winnipeg’s Only “Super Truck” Featuring 1 Hour Dry Times! INTRODUCING RX-20 FOR TRUCK MOUNT CLEANING! INTRODUCING THE ZIPPER CLEANING SYSTEM! We’ve added another tool to our ever growing arsenal of dirt and grime eradication systems. We are convinced that tough carpet stains and soiling are history with this powerful new dual suction, high power, fast drying system. Look at the immediate results below and then call us for your free quote! With our green cleaning system, we guarantee that we will out clean anyone, your carpets will dry faster, be cleaner, brighter, healthier, and stay that way months longer. Ask about our “State-of-the-Art Dual Cleaning System”, guaranteed to get carpets cleaner than our competitors! Whenever possible we prefer to use an environmentally responsible minimal moisture cleaning method. Our Green Encapsulation Cleaning system significantly decreases the amount of water introduced into your facility for the cleaning process. We use a minimal moisture cleaning system that uses only 3 gallons of water to clean a 1000 square foot of carpet as opposed to HWE (hot water extraction) also known as steam cleaning, which uses 50 to 80 gallons of water per 1000 square foot Our system completely eliminates contaminated waste water that is created and disposed of on your property. It also eliminates wicking (spots returning the next day or so after cleaning). Our low moisture process usually dries in less than an hour. There is virtually no chance of microbial activity (mold) associated with the 8-12 hour or more extended dry time for HWE. Our customized professional programs and services ensure your company has its best foot forward. Your image nurtures a positive perception that affects your business. The owner of Ultra-Clean understands this connection and has provided quality, reliable commercial carpet and upholstery cleaning services to businesses for over forty years. Our specially EPA and Green Seal Certified cleaning solutions are made specifically for commercial carpet maintenance. This formulation is deep penetrating, requires no rinsing, eliminates wicking, and prevents recurring spill stains. It is safe for all types of synthetic carpet fiber, most wool, and any other fiber that can be exposed to water. The soil retardant ingredient will leave carpet more soil resistant, without a sticky residue that attracts soil. This is a truly green cleaning system. It cleans more effectively in far less time and it’s more economical than HWE. It does all this with the least environmental impact on the building and the earth. Whether your business has 1,000 square feet or 100,000 square feet of carpet, you have an enormous investment in the initial cost. The need to take care of this investment becomes clear as you start to witness premature wear and aging. At Ultra-Clean Winnipeg, we are the authority in restoring and maintaining your business’s carpeting. We have the only carpet cleaning instructor on staff with over twenty five years of teaching experience and the only IICRC Certified Senior Carpet Inspector and Master Carpet Cleaner in the province. Our technicians are IICRC Certified in Carpet Cleaning, Upholstery Cleaning and Commercial Carpet Maintenance Cleaning and are also CGCA Certified in Green Carpet Cleaning. In addition to our IICRC certifications Ultra-Clean Winnipeg has earned the coveted “Approved Service Provider” designation from the Carpet and Rug Institute. Ultra-Clean Carpet Cleaning Winnipeg is recognized as the expert in carpet restoration procedures and we do it with “Green Technology”. We specialize in developing carpet maintenance cleaning programs, we will customize the best program to fit your company or business; explain the benefits of tailoring a program that maximizes your flooring maintenance budget. We currently maintain over a million square yards of carpet in Winnipeg. We have discovered through experience however, that dedicated use of our (C.A.M.) Carpet Appearance Management program can often delay the required restorative cleanings, in most cases by years. Our customers have always required something else from Ultra-Clean. They’ve asked for, and been given, choices that best serve their individual circumstances. Our promise; no system we utilize will ever compromise your standards, our results and especially our relationship. Ultra-Clean Winnipeg is constantly educating its people and searches for better ways to meet our customer’s goals while providing the best results possible in every situation. 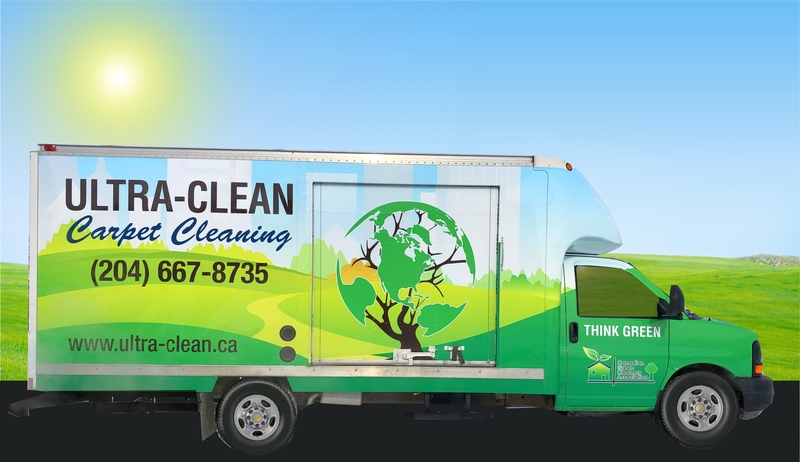 It is for this reason we offer two “State of the Art” cleaning methods; Winnipeg’s only “Super Truck Mount” and our exclusive “Green Encapsulation Cleaning System”. Soil removal — CRI uses NASA-enhanced x-ray fluorescence technology to measure the precise amount of soil removed from the carpet, and soil removal efficiency. Water removal – the extractor or system must remove most of the moisture resulting from a wet cleaning process. Dirty water that remains in the carpet could be a source of fungal growth and could prolong the drying process. Texture retention – the extractor must not harm the carpet pile. Regular professional cleaning is as important to your carpet as having a trained mechanic perform routine maintenance on your car. What vacuuming and spot cleaning miss, extraction cleaning should fix. The truck-mount is the machine, while the deep cleaning system is the combination of that machine and a particular cleaning solution, following a set procedure. “Research has shown that many products sold for do-it-yourself spot removal clean poorly and their residues attract soil on the cleaned area rapidly afterward. The Carpet and Rug Institute’s Seal of Approval program tests and certifies products that meet stringent standards and thus clean effectively, without damage to your carpet.” The CRI website (www.carpet-rug.org) is listed for reference to these products. It is for this reason that Ultra-Clean Carpet Cleaning uses The Carpet and Rug Institute’s Seal of Approved cleaning products. Our main cleaning product is Procyon. Procyon is used not only in homes around the world but also in the White House, Air Force One, museums, and allergenic clinics, hospitals, schools, daycares, restaurants, hotels and office buildings. Providing an environment free of toxic chemicals and allergens is of critical importance. Procyon is so safe it’s even been used to clean the carpets of the offices of the Environmental Protection Agency.